Like many folks who need to work on things, I started out with an old pickup truck. I loved this truck. It never gave me any problems and over time I think it was hit by everything but the lottery. I had bolted three nice, lockable diamond-plate toolboxes onto the truck along with a huge ladder rack that I was given by a man who owed me money. That long-bed Dodge and I built my small landlord business from the ground up. I could barely squeeze in the cab because of all the larger tools that took up shop there. The toolboxes were inevitably overrun with extra parts, odd sized pieces, half-used caulk tubes and every other manner of repair paraphernalia one can imagine. The cab of the truck held the tools that were too large to fit in the boxes and too valuable to get wet. My truck, like many, began to look like a mobile hoarder display. This truck never let me down, even when I truly believe it wanted to. The old girl just kept on, keeping on until I finally outgrew her. The day I sold her I nearly cried. I felt like I was breaking up with a high-school sweetheart. My consolation came in knowing that she had found a home perfectly suited to her, where she would be well appreciated. I sold her to a handyman I worked with for many years. “Old Uncle Bill”, as I called him, was in his 70’s and never missed a day of hard work. He had trucks older than my girl and had them held together with every thing he could think of, never allowing them to quit because he wouldn’t. Old Bill would pull up in my truck and swear that truck about drove itself to our usual job sites. He would kid me that it took him months to train her to drive to his house instead of mine at days end. I never felt more peace in that truck as I did seeing just how much Bill loved her. That truck provided a means for Bill to continue making a living for his family. He worked harder than any two young men I knew and always did so with an enthusiasm for the job and for life. When I sold that truck, I did so because my small rental property business had reached a point that I could no longer carry all that I needed in it. I constantly found myself without the one tool I needed and nowhere close to home to get it. Worse yet, the larger tools would get stashed at one property or another and I would have to drive all over town to get them, wasting both gas and time. 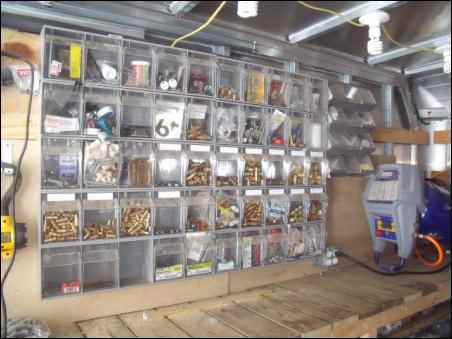 I would spend hours a day, it seemed, just digging through the bottom of the toolboxes looking for screws, fittings and other small parts. Not being a patient man, I realized that this had to stop. 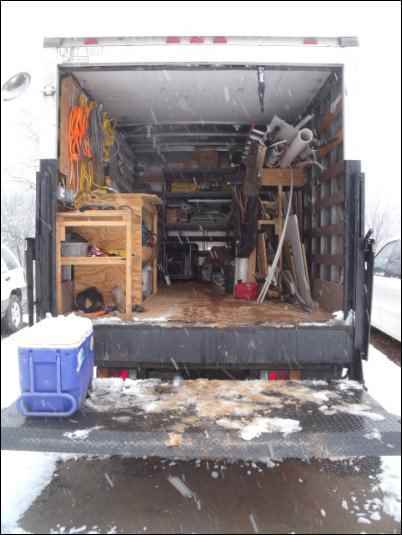 I needed a mobile workshop, one that was large enough to carry my materials, supplies and tools, but small enough to maneuver in and out of the mountain rental properties I owned and repaired. I also needed enough room to move appliances and to be able to do so by myself. I had spent years twisting my back into a pretzel trying to slide a refrigerator over the tailgate and under the ladder rack on the old Dodge. A used refrigerator simply wasn’t worth the risk to my back, but, neither could I afford to buy new refrigerators and have them delivered each time one went out. I looked into pulling a utility trailer, but, again ran into the time it took to run across town to get the trailer and then pickup appliances and other large items, move them and then return the trailer, all the while exposing them to the elements and possible damage or theft if left unattended while I worked on some other repair. 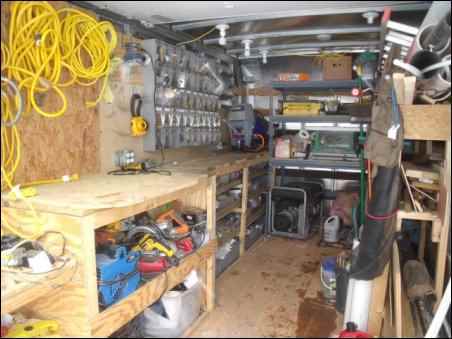 I looked into buying a cargo-style van that would allow me to store tools and repair supplies more safely but found that I still did not have the room to house the building materials, such as plywood and lumber, that I routinely required. This would mean I would still have to travel across town to buy or pickup these items and transport them to the jobsite. Larger appliances would still require the use of a utility trailer. I dreamed of a tool shed on wheels. I wanted something that would allow me to keep what I needed on hand to fix nearly all the problems I could encounter in a day of repair calls as well as a vehicle that could move appliances easily so as to save my back. I looked at old bread delivery trucks but they never seemed be in very good condition. I looked at used moving trucks but these were far too long for the type of properties I would need to enter. I looked at old moving-van-style trucks but these were often in poor shape, although this may have just been my luck in finding them so. 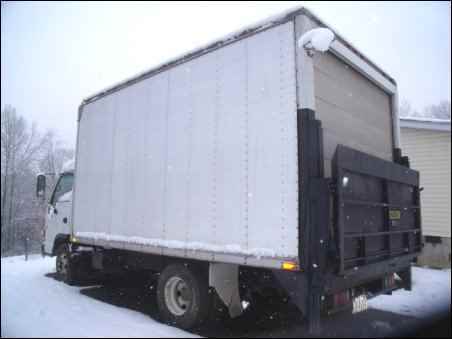 I looked at some small delivery trucks but many of them had air brakes, which I did not like, and many did not have a lift gate that would allow me to load and unload large appliances easily. The more I looked the more I found the prices became more and more expensive. I talked with repairmen, electricians, handymen and deliverymen (and women) who drove trucks of different styles. Most that owned their own trucks liked them, but, they also candidly admitted they also had huge payments they did not like. Many had paid well over $30,000 for these trucks, and then some. One day I stopped by a used truck store and found my new girl (well, my new truck that is). This truck had likely been a delivery truck for an appliance rental company. The truck was a 14-foot box truck with a garage style door on the back as well as a lift gate that can lift up to 1600 pounds (even our best fridge had plenty of room to spare and no more aching back). This truck has a turbo diesel engine with plenty of power and a gross vehicle weight of 12,000 lbs, which meant it did not require a commercial driver’s license in my state. The “cab-over” design has a cab that is detached from the box of the truck and is set over the front wheels. This provided me with a turning radius far superior to my old pickup truck, believe it or not. This truck was three years old and had about 72,000 miles on it. The automatic transmission made it as easy to drive as any car I have ever owned. The driver’s seat is set rather high in the air with a large, flat windshield that provides excellent vision of the entire road. My friend used to kid me that I was sitting up high enough in front of that windshield that he could tell what shoes I was wearing when I passed him. This truck is an Isuzu, 14-foot box truck, turbo diesel NPR model with lift gate. I paid $18,000 for it at the car lot and was happy to do so. Yes, this was far more than I had paid for my old Dodge truck, and more than I had paid for any car, but I finally had something that would meet my needs, and later I would learn, far more than I had ever considered. This truck became more than my all purpose work truck. I immediately drove the truck to a friend’s house and we began turning the empty box of the truck into a workshop on wheels. We built a large wood bench with many, many shelves. I added metal shelving at the far end to hold larger tools such as tile saws, table saws and the like. I hung clear, tip-out bins that held all of my plumbing (pex) fittings, electrical supplies, screws, bolts and more. We built a wood rack to suspend long plumbing supplies over a vertical rack that holds plywood and other larger, thin materials that can stand on edge. The rack also held lumber such as 2×4’s and other assorted sizes. An electrician I know helped me run lighting and electrical outlets throughout the truck. These do not run off the truck battery but rather I plug the truck into a house outlet or generator to power up the workshop portion of the truck. This setup allows me to work while standing inside the truck, which really comes in handy during rainy weather. I can run the power tools as well as recharge the cordless tools while working inside the covered workshop. Loading the truck is a cinch since the floor of the workshop is about waste height. I can lower the gate to the ground and roll a lumber cart right up to the floor of the workshop for easy loading and I can stack smaller, heavier items on the lift gate so as to raise them up and slide them in. Unloading the truck was even easier and no more breaking my back! I have found many creative uses for the lift-gate itself. Everything from portable platform for painting off of to sawhorse for holding wood I am cutting. I have even used it to bend small metal rods in a pinch. I have left the tailgate down and level to the workshop floor when hauling 16-foot cattle panels, which made these odd items a dream to move. The workshop on wheels has become a home away from home more than once. The large floor space makes easy set up for a makeshift bunk to sleep in on overnight jobs. I even took this truck camping and propped the door open a couple of inches and slept through one heck of a rainstorm. The drumming of rain on the metal roof was loud at first but the warm, dry workshop turned cabin made for peaceful sleep (and no there wasn’t any lighting in the area that night). While I did not want to spend $18,000 on a truck, I knew that I would make such great and varied use of it that I would quickly recoup my investment. Many of my friends and family have paid far more than this for their large pickup trucks and sport utility vehicles, driving them mostly to and from work without doing any real work out of them. A good friend of mine did me one better by buying the exact same truck as mine off of eBay for $13,000 cash (over $5,000 less than I paid) and had it delivered to him from out-of-state. Because this was such a large cash transaction with an out-of-state seller it was a bit nerve racking until delivery was actually made. I may have overpaid a bit for my truck but I was able to finance it at the dealership and later pay it off ahead of time because of the work it allowed me to do. These trucks are still available online as well as at used truck lots like the one I bought from but now the prices have dropped quite a bit, making them even more of a bargain. I have found that for the small homesteader like me, this type of truck is invaluable. I bought a foreclosed property that had been damaged by the previous seller and needed weeks of work. I all but lived out of this truck for several months while working three days a week on the home and property in order to make it habitable for my family. This truck easily hauled all the lumber we used to build the decks and steps leading into the home, not to mention all that 16-foot long cattle panel and other fencing materials I needed to setup my pasture and runs. I moved furniture, appliances, tools and materials all while having the ability to keep them safe and dry. I could even stop off to eat and not worry about someone running off with my tools. Materials were kept dry and safe onsite while locked inside the truck as well. I have not begun to exhaust the uses for this truck. I have hauled cages of rabbits from farm to farm, as well as chickens and dogs (don’t worry, I left the garage door open and gate up for plenty of air and protection), chicken coops, straw, railroad ties, and much, much more. I have even moved a friend or two in a pinch (the one concern of having your own mini-moving truck). Plants, raised bed gardens, and even the soil have been relocated using this truck. I have sat in lawn chairs on the lift gate creating a makeshift summer porch with cool beverages enjoyed while watching various events from this elevated perch. The list goes on and on. While I would not have previously considered a truck like this for my homestead or family I can honestly say that I cannot now imagine being without it.